So much of the appeal to owning a backyard swimming pool is the SOUND of water splashing and flowing, the laughter of kids playing, and the relaxing evenings spent in your very own oasis. A large contributing factor to the pleasing scenery you’ve created is the type and style of water feature, water fall or fountain you choose for your pool. Here are a few things to keep in mind when making a selection in your backyard. The farther the fall, the larger the sound. It makes logical sense that Niagara Falls is louder than a water fountain, yet both sources produce the sound of running water. Make sure the water fall you select is proportionate to the size and environment of the rest of your backyard. A 10′ water fall sounds great, but may not be the best fit for a 12×20 swimming pool. Conversely, adding just 2 deck jets to a 16’x40′ pool and spa with a pergola and 1200 sq/ft of deck space may not be appropriate either. The water feature’s size and sound should match the overall scope and esthetic of the project. 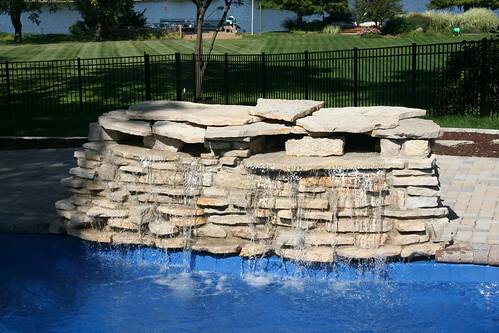 If you have questions about water features, water falls or fountains for your swimming pool, feel free to contact us at 630.845.1145 for further information. 2 Responses to Water Features, Water Falls and Fountains: What’s the best choice for your pool? Thanks Julie! I hope you all have a great pool season up in Rhode Island!